The kids are back at school, fall's almost here, perhaps now you can focus on all those messy nooks and crannies that have been staring back at you all summer. But are you tired of chemical cleaners? Worried about the impact on your family's health?... Find out how best to clean your home naturally and safely with tips and tricks from the experts at Vancouver-based AspenClean during our Healthy Home Q&A on Wednesday, September 19th, 10:00am to 8pm PST. AspenClean are makers of the only line of Canadian-made natural household cleaners with the esteemed EcoCert 100% natural certification from Europe. We're kicking off at 10:00am PST and you're welcome to post any questions and comments concerning cleaning your home throughout the day on our official Lavish & Lime Facebook page here. Separate posts to our page work best and help keep the Q&A flow clear. Our friends at AspenClean will be checking in periodically throughout the day and posting responses to all your questions, so keep checking back. We'll wrap up at 8pm PST with a prize draw for some great natural products to help you keep your home clean, safely. Ask a question or post a comment and you could WIN. Prizes will be awarded to winners randomly drawn from all Q&A participants who post on our Facebook page. 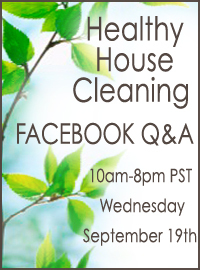 We hope you can drop by at some point - and get answers to all your cleaning questions!